Combining covered call writing and selling cash-secured puts into a multi-tiered option strategy is one way to hedge against bear and volatile market environments. In my book, Selling Cash-Secured Puts, I refer to this as the PCP or put-call-put-strategy. First I will give a general overview of the strategy and then an example using specific calculations. We start by selling an out-of-the-money cash-secured put (strike below current market value) that meets our goal for monthly returns (2 – 4% in my case). If the option goes unexercised (price remains above the strike price), the cash is then freed up to secure another put the next month. If the option is exercised and the shares sold or “put” to us, we have then purchased the stock at a discount from the price when the put trade was initiated and proceed to sell a covered call option on the discounted stock. If the call option goes unexercised, we continue to sell calls on the security as long as it meets system requirements. If the call is exercised and our shares are sold, the newly-acquired cash is now used to secure another put. Covered call trades can be entered with stocks at a discount using a multi-tiered strategy involving put-selling as well as covered call writing. I believe that this type of strategy is best utilized in bear and volatile market conditions as well as for investors with lower risk tolerance. It is critical that we master both legs of these trades and are prepared to execute exit strategies when the opportunities arise. Use promo code PUT5 for a $5 discount @ checkout. I am humbled to say that orders, thus far, have been off the charts…thank you so much. I have asked the publisher to double the production and send BCI more books as soon as possible. Shipping started on 12-12-14 based on when orders were received. The next shipment will go out on 12-17-14. For the week, the S&P 500 declined by 3.5%, for a year-to-date return of 11%, including dividends. If I have approval for covered call writing will I automatically also get approved for selling puts? Can’t wait to get your new book. the “Reports” section. Look for the report dated 12/12/14. 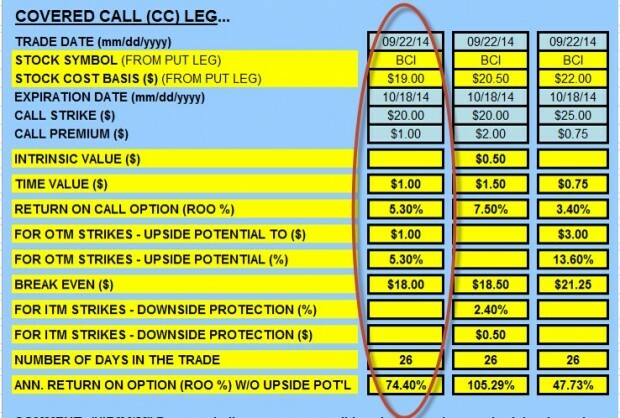 BCI must be a pretty volatile stock to get 7%/mo with an OTM strike. The return on the call and put was 5.3%…still a little high for an OTM call. I just made up some numbers to get the general point across…real life examples in my new book. Alan, I have reposted below some questions from two blogs back. These are all based on the 3 things of, being at the end of the contract period, where you have just had a negative months return on some particular stock, and are now deciding to use again or else selling it. 1. You say that if you had a negative return on a stock for the month that you will use this same stock again if it is Outperforming the S&P500. But will you still use it if the technical indicators are mixed too? From the above situations I am trying to understand what you may be thinking when undergoing the chart analysis. 1- Yes, but will usually write an ITM call. 2- No, there will be better candidates. 3- No, absolutely not…no earnings reports. Buying protective puts will protect against precipitous drops in price and also decrease position profit. I simply avoid ERs. Please keep in mind that I have no issue with selling a poor-performer, but a security that has been impacted by the overall market may still deserve a spot in our portfolios. My team and I have been working 12-hour days to accommodate the huge response we’ve had to my latest book (thank you, thank you….). The 2nd shipment has now been sold out and a 3rd ordered. All books ordered after 12-8 will be shipped next week. As a result we have been unable to respond to email and blog inquiries at the rate we normally do. We should be all caught up by next week. Thanks for your understanding and incredible support. We expect to have a basic version of a put calculator on our site in the near future. We also will have a Beginners Corner for puts as we do for covered calls. The video you are referencing is on our Youtube channel but the series is not complete yet. We are also working on an expanded version which will incorporate both puts and calls. Are you still planning to release an expanded put calculator. I would be interested in better understanding the P-C-P strategy. Yes, we are working on a PCP Calculator and it is near completion but we are also working on enhancing our entire site in the next few months so we want to double and triple check all aspects of our site before initiating these enhancements including the calculator and other new tools. Thanks Alan for those answers and I have as usual noted down as I think will really help. It also looks as though that it doesn’t matter if your end month return was positive or negative, that your answers are still going to be the same in those situations anyway. Think that will do for now so enjoy the Xmas break and will return again in New year! I just watched your video on “Using Put Options To Buy Stocks At A Discount” and that is just what I did with Pandora about month ago. It was exercised from a put sale of which I made $650. but since then the stock has lost nearly 25% of it’s value. Others got into the business and their growth was stagnant. I have been selling calls for about $1200 dollars worth but stock is too low to sell without significant loss. There is a lot of controversy as to it’s recovery. So the Question. Your opinion on stock that reverse in general. I don”t want to lose because of panic thinking.My plan is to keep selling out of the money calls until it comes back or I recover loss on stock price. I can speak in general terms about a stock that has declined in value as has this one (underperforming since March). 1- We always need a plan in place in case this occurs. When selling puts, exercise is part of the strategy. Once the shares were put to you, you can hold for the long term (not your plan I assume), sell the stock based on fundamental, technical and common sense assessment or write calls (the selected path). 2- Holding a stock should never be based on purchase price but rather on where the cash currently in that security is best suited for max returns. For example, a loss of $500 is not good but better than a loss of $2000. 3- Ask yourself this: Would I buy that stock today at this price…be prepared to provide a good reason to yourself for whatever your decision is but do not base it on a decision made in the past…it has no relevance at this time. 4- One of the most difficult things for retail investors to do is to “realize a loss” Been there, done that. When we have a plan in place that is non-emotional in nature based on those sound fundamental, technical and common sense principles, decisions are much easier to come by. I’ve purchased all your books. 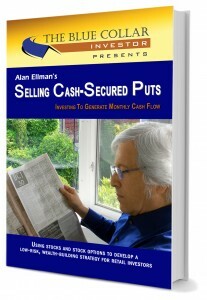 Including your newest book, Selling cash secured Puts. So far I can’t figure out why selling an in-the-money Call over an out-of-the-money Call would be an advantage. Except if the stock goes down in value. Please shed some light on when to go ITM, OTM or ATM on covered calls. The actual in initial profit we receive when selling call options is the time value component of the premium. In the case of ATM and OTM calls, the entire premium is time value. ATM calls generate the highest initial returns with no chance of additional profit from share appreciation. OTM calls give us the opportunity to generate the highest overall returns via 2 income streams: one from option premium and the other from share appreciation. ATM and OTM call call-selling are bullish strategies. Selling ITM calls generates premiums with 2 components: time value and intrinsic value. The time value only represents our initial profit. The intrinsic value represents an insurance policy or a buffer zone that protects this time value component. In other words, share price can drop from current market value to the strike and the time value profit remains intact. By the way, this insurance policy is paid for by the option buyer, not us. Stated differently, intrinsic value protects time value and this is a more conservative approach to cc writing than ATM and OTM options. I am anxiously checking the mail for the new book on Selling Puts. For the third candidate down list, AFSI ($56.87) the Jan 57.50 Calls look mighty nice at $2.75 or 4.8%. But then I calculated the Jan 55 Put and that yields a premium of $4.20, sweet. If I’m doing my calculations correctly that is 7.3% for what will be about 30 calendar days! That is a nice use of $5,687 if I ever saw one, and to have the stock put to me at the lower cost basis to sell back Calls for an IBD 50 ranked stock, well that ain’t too shabby. It is hitting a ground rule double! It does cause some nice angst and extra time in doing my homework because of the multiple choices, but good choices for which to make decisions. Thank you for sharing, I have had my retail brokerage account approved to the next level for selling puts, so off I go. As you will see when you read my new book (thanks for the purchase), is that both strategies can be put to excellent use depending on market assessment and personal risk tolerance. In your scenario, if the put is exercised and shares are ‘put” to you, you can now write calls on the newly-acquired shares. One other note: high option premiums translate into more volatile stocks and a market anticipation of larger price movements…be prepared with our exit strategies just in case. This week’s 8-page report of top-performing ETFs and analysis of ALL Select Sector Components has been uploaded to your premium site and is available in the “ETF Reports” section. Look for the report dated 12-17-14. Enter promo code PUT5 to get a $5 discount at checkout. Our first 2 shipments have been sold out. All new orders will be shipped next week. I received the new book today and am still half-way through it. I am a big fan of your covered call strategy book (the first book), which has consistently given me good results. Just a thought (not sure if this is even practical). If selling a put option requires us to have margin in our account (equivalent to the (strike-premium)*100), couldn’t we sell a call at the SAME time? I would assume it would be still called “covered” because of the margin amount. During expiration, since only the put leg OR the call leg would be exercised and not both, aren’t we secured or “covered” on both ends? I admire our members who think “outside the box” It’s interesting that recently I’ve had a few inquiries about such a strategy. 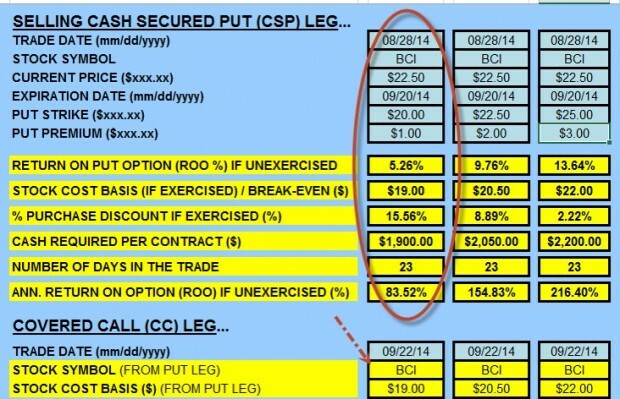 Buying 100 shares of stock and then selling an OTM call and an OTM put is known as a “covered combination” Most brokerages will require retail investors like you and me to also secure the put sale so in essence we would be in 2 trades: a covered call trade and the sale of a cash-secured put. We are not leveraging our position with less of an investment. Since we have had several members express interest in this approach I will write a blog or produce a video detailing the various aspects of this strategy. The news is that FFIV will be removed from the NDX 100 before market on 12/22/14. I hold covered calls on the 130 Dec 19th call. Do stocks being removed from an index historically fall in price? I would love your insight, if unwinding is needed. Also….BKW turned into QSR on 12/12/14. I also hold covered calls on the 35 Dec 19th call. When a company merges, does the brokerage company handle all of the paperwork? What concerns me is that both tickers are still on my account. 1- When a stock is removed from an index I explore why it was removed and the market reaction after the announcement. I can’t tell you what to do but generally, if a stock meets our fundamental, technical and common sense criteria and is performing well after the announcement I will hold my position and treat it the same as other stocks in my portfolio. 2- Contract adjustments due to mergers and acquisitions can be tricky and difficult to understand. They may involve a number other than 100 as deliverable securities. There may be cash considerations. Your broker may not have a full understanding of the final adjustments at this time. Contacting your broker and inquiring about closing such a position is something we should consider. 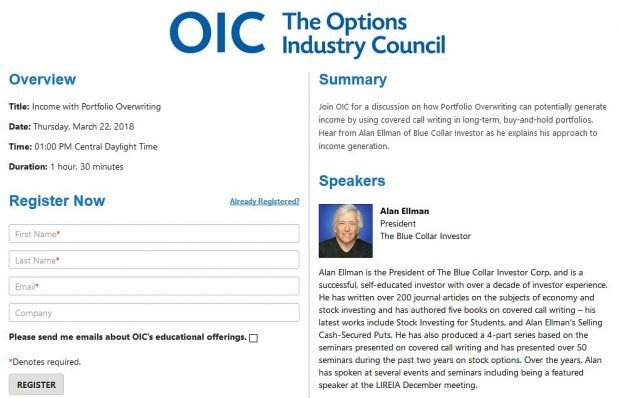 There is nothing to panic about here because the OCC makes sure that both buyers and sellers of calls and puts are “made whole” after the adjustment. The issue is understanding the option contracts post-acquisition. What are the implications & recommended course of action, if any, when one finds the ASK price of a currently owned Option to be greater than the ORIGINAL sale price of that option? To give an appropriate respond, I’d need to know the circumstances motivating the closing of the short call. For example, if unexpected bad news has come out and we are concerned about significant share depreciation, we close and take a small loss on the option side. If we close because the stock price has accelerated dramatically and time value is approaching zero, we make up for the option debit with share appreciation credit. Different circumstances will dictate the appropriate path to take. All recently ordered books and those ordered over the next few days will be shipped on Wednesday as our next large shipment will be received in our office on Tuesday. We are currently totally out of inventory. Thanks so much for this amazing support for my 5th book…I hope you feel the book is worthy of the confidence you’ve expressed in me.